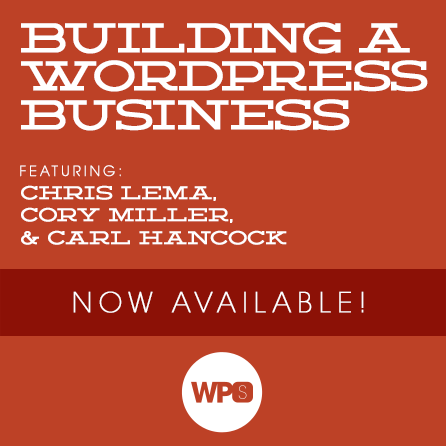 Join Chris Lema, Cory Miller, & Carl Hancock for a deep and informative look at how to build your business around WordPress. Learn how to take the plunge and start your startup, then grow it into a healthy team. The session will conclude with an open panel discussion featuring all three presenters. Each of our sessions feature 3 separate presenters focusing on a specific aspect of some WordPress topic. Each presentation will have roughly 30-40 minutes allotted for instruction and 15 minutes allotted for Q&A at the end. This means that each session is scheduled for approximately three hours (give or take a few minutes for opening and closing remarks, plus intermission between presenters). For this session, we’re diving deep into the world of building a flourishing WordPress business. The topics here aren’t strictly specific to WordPress, but sage wisdom from brilliant community members who have each found incredible success thanks, in part, to WordPress. With the experience that can only come from starting and running five start-ups, Chris Lema is going to tackle the challenges of growth, particularly when it comes to growing the internal team. Whether you’re a solopreneur looking to hire #2, or a small team of engineers looking to hire your first marketing person, his tips, strategies and lessons learned (mistakes) will help. Cory Miller will introduce us to his passion of being a great leader, and running a successful company. Cory loves his team like a family, and he wants to teach you to do the same. When you view your team like a family, a profound and powerful thing happens: it helps you to go farther together than you ever could individually. After this we’ll open the session to a panel discussion featuring all three experts, Chris Lema, Cory Miller, and Carl Hancock. We have a few primer questions to get the conversation rolling, but the balance of the time will be available to attendees to ask their pressing questions. This is a tremendous opportunity, and one you’ll almost certainly want to experience live. Plus a panel discussion with all 3 presenters! Cory is a former newspaper journalist turned full-time web entrepreneur. In January 2008, he founded iThemes in his home, fulfilling a lifelong dream of running his own company. Now iThemes has grown to over 20+ team members, hundreds of products and thousands of customers worldwide. Carl Hancock is one of the co-founders of Rocketgenius, Inc. A premier provider of WordPress plugin solutions and the creators of one one of the most successful commercial WordPress plugins: Gravity Forms. He loves building innovative solutions for WordPress, and is a devoted father, loving husband, amateur photographer, startup founder and travel addict.